Bookmans stores across Arizona will be hosting a Summer Sale this weekend, July 15th and 16th! Stock up on everything you need to escape the heat this summer and be entertained…indoors! 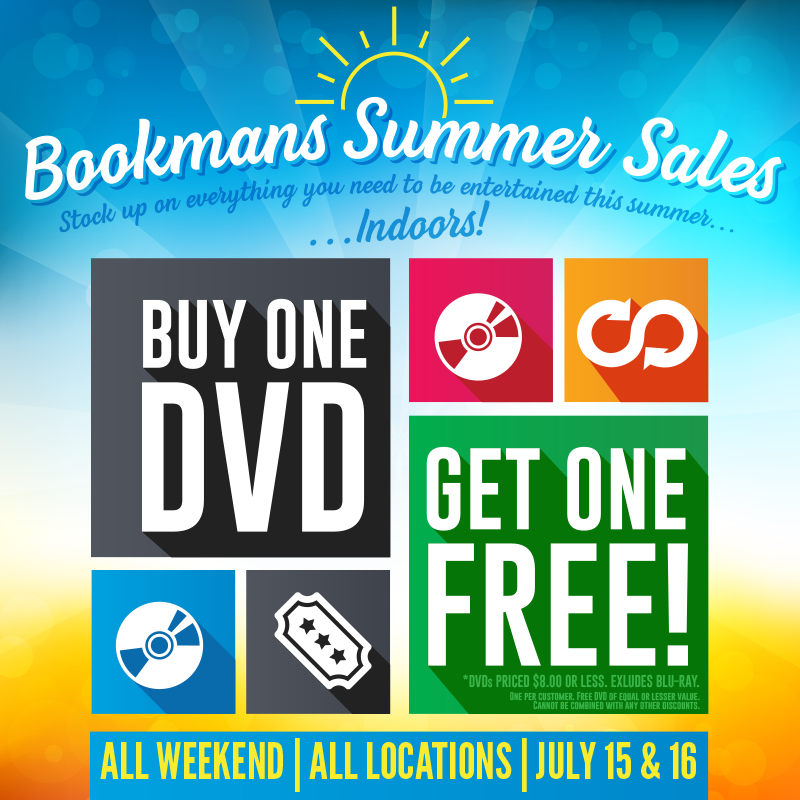 Head to Bookmans stores for this sweet Summer Sale as we offer a buy-one-get-one deal on all DVDs priced at $8.00 or less. This promotion cannot be combined with other offers or discounts and is limited to one per customer. In honor of this amazing sale, we would like to offer up our suggestions for a few double features you could pick up at the Bookmans Summer Sale. These are films that we love and think you could too! So sit back and relax as we provide some cinematic options sure to combat any restlessness during these hot Summer months. Highly entertaining if not incredibly disturbing, both of these films involve adolescents killing each other for the enjoyment of others. In Battle Royale a group of 42 students are given a bag of weapons, dropped off on a deserted island and forced to fight for their lives. In The Hunger Games, Katniss and Peeta’s experience parallels that of Battle Royal with the added intrigue of unrequited love. Both brought to you by the creative genius that is Jim Henson, Labyrinth and Dark Crystal offer up a unique story and rich fantasy complete with puppets and David Bowie – not to mention all the ’80s glory that is hair, puffy sleeves and synthesizer. Be warned, though. These films contain puppets that can be a bit scary, especially The Dark Crystal which was inspired by the terrifying original tales of the Brothers Grimm. There you have it! Just a few double feature options you can purchase at the Bookmans Summer Sale this weekend, July 15th and 16th at all six Bookmans Entertainment stores. The buy-one-get-one DVD sale cannot be combined with other discounts and offers and is limited to one per customer. DVDs included in the sale are valued at $8.00 or less and excludes BluRays. So head to your nearest Bookmans this weekend and #SeizeTheDeal! Hello Corina! Unfortunately, we do not have an online inventory. IF you give your local Bookmans store a call they can check their stock and possibly hold a copy for you too. All store phone numbers and addresses can be found here: http://bookmans.com/stores/ Hope that helps!